The 90’s era was highly dominated by the Yash Chopra style of candy floss type of romantic films shot in the Swiss Alps and other foreign locations along with a Sooraj Barjatya type of emotional family drama. 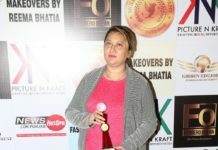 The era ended with the arrival of a young director Karan Johar, who managed to blend Chopra style of the films and Barjatya’s family dramas and presented them in his own style, catering to N.R.I and urban audience. The ingredients were mostly same in some of his produced and directed films. These films managed to establish the brand of Karan Johar type of films. Though, there were films like ‘My Name is Khan’, ‘Kurbaan’, ‘Wake Up Sid’ and a few more which broke the stereotype branding, but at the same time had music, which bear the stamp of the Karan Johar type of films. His latest offering ‘Ae Dil Hai Mushkil’, has been in the news for various reasons. 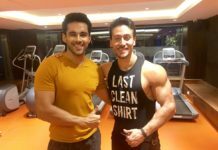 These controversies along with chartbuster songs and interesting star cast has managed to raise the expectation level. Thus, let’s find out whether ‘Ae Dil Hai Mushkil’ will live up to the mammoth expectations related to it or might end up being yet another project based films trying to cash in over the mood of the festive season. 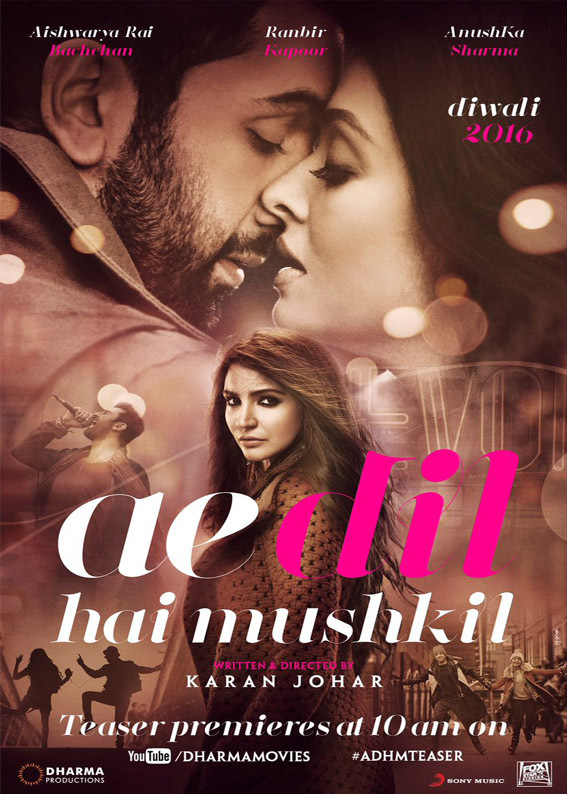 ‘Ae Dil Hai Mushkil’ is a story of a rich, spoilt brat Ayan (Ranbir Kapoor) who meets Alizeh (Anushka Sharma) in a random party. Both are going through a rough phase in their personal lives and thus connect with each other as good friends. Their friendship keeps growing stronger and stronger until the time when Ayan starts developing romantic feelings for Alizeh. Before he could take his love forward, Alizeh meets her ex-lover Ali (Fawad Khan) and decides to lead a married life with him. Heartbroken Ayan seeks solace in a high society poet Saba (Aishwarya Rai Bachchan) but fails to forget Alizeh and his feelings for her. What happens next is what the entire film is all about. The story has lots of similarities with one of Ranbir Kapoor’s best films ‘Rockstar’, especially in the second half of the film. It’s just that ‘Rockstar’ was intense while out here everything is glamorously presented. Though, the first half is totally interesting as well as highly entertaining. The whole Ranbir – Anushka bonding track is amusing. There are some enjoyable scenes such as Ranbir – Anushka’s first meet followed by their double date with Lisa Haydon and Imraan Abbas, Ranbir dancing on ‘Tofha’ song followed by dancing on ‘Baby Doll’, Lisa Haydon track, Ranbir – Anushka vacation in Paris followed by their tribute to films like ‘An Evening In Paris’ and ‘Chandni’, Ranbir – Aishwarya first meet followed by Shahrukh Khan’s cameo, Ranbir – Aishwarya – Anushka dinner meet, Ranbir’s retro mash up to cheer up Anushka and few more. These scenes go perfectly with the flow and mood of the film. On the flip side, couple of Ranbir’s acts in the first half were a bit weird followed by the lack of intensity in Aishwarya’s half-baked track. There are lot of repetitive situations where Ranbir is only shown running from one end to another. The finale moments are highly dragging and unconvincing at times. The ending is bit abrupt. The graph of the movie highly slides downwards in the second half of the film. The relationships are not properly justified. The screenplay in the second half is weak, dragging and forced. It’s only the songs and some enjoyable moments that keep you glued to the silver screen. Dialogues are captivating, especially in case of Anushka and Aishwarya Rai Bachchan. The cinematography by Anil Mehta is of top notch and matches up to the brand image of the Karan Johar style of films. Music by Pritam is superb. All the songs are catchy as well as chartbusters. The title track is the soul of the film while ‘Bulleya’ has full intensity and passion attached to it. ‘Channa Mereya’ is soulful. ‘The Breakup Song’ and ‘Cutipie’ lifts up the mood. Usage of retro songs, right from Noorjehan to R.D. Burman’s tracks are enjoyable. Director Karan Johar mostly gets his basic germ ideas from other films (‘Kuch Kuch Hota Hai’ from ‘Dil Toh Pagal Hai’, ‘Kabhi Alvida Na Kehna’ from ‘Silsila’, etc) and in case of ‘Ae Dil Hai Mushkil’ it has its roots which connect to ‘Kuch Kuch Hota Hai’ and ‘Rockstar’ followed by a forced track which reminds you of ‘The Fault in Our Stars’. The move is entertaining in the first half and drags a lot in the second half. It’s an average effort by the filmmaker where there is nothing new or uniqueness attached to it. Ranbir Kapoor looks fantastic and does his part with total grace. There are some scenes (like the first shot where he is asked about his true love, his reaction over meeting Fawad followed by a forceful smile in Anushka’s marriage, remembering Anushka after meeting Aishwarya and few more) where he excels to the fullest. Anushka Sharma is superb in her role. The movie belongs to her as she is fabulous in her appearances, characterization, Bollywood passion and mouthing some great dialogues. Aishwarya Rai Bachchan looks stunningly gorgeous, but her part was half-baked and lacked the intensity. Fawad Khan is highly wasted in the movie. Cameo by Lisa Haydon is highly hilarious followed by a cameo by Shahrukh Khan, which is fantastic and ends up as one of the best scene from the film. Special appearances by Imran Abbas and Alia Bhatt are enjoyable. On overall basis ‘Ae Dil Hai Mushkil’ is like an aristocratic affair belonging to the typical genre of Karan Johar style of films. It’s like the same festive sweet which one can enjoy on that particular occasion only, lacking the longevity and uniqueness.